Well, the cat is out of the bag. Emisar has a new light called the D4S. It’s like an Emisar D4, but sized for a 26650 cell, throwier, and with some other misc improvements. 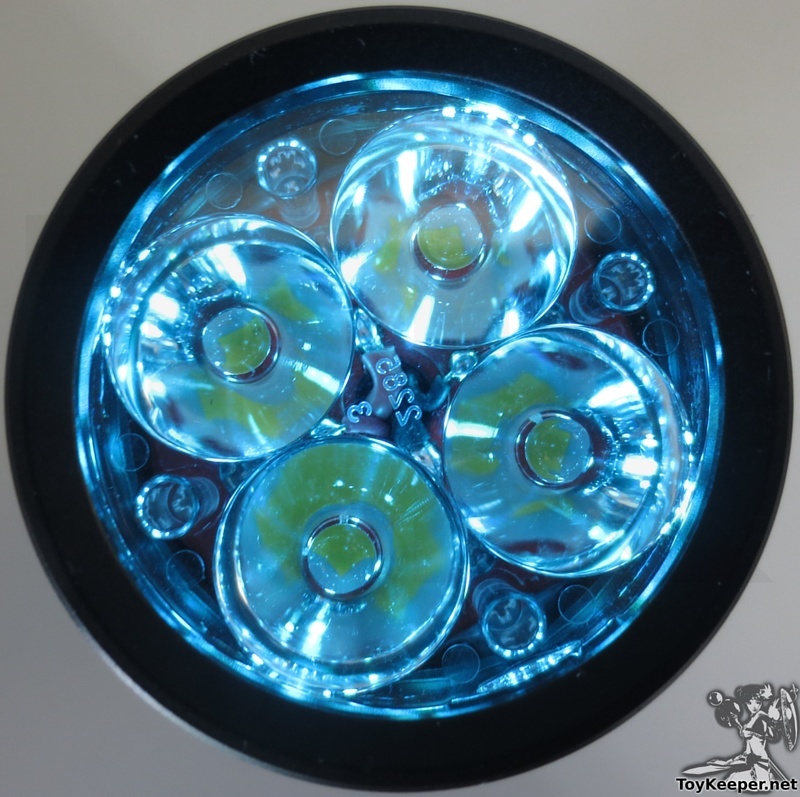 It also has cyan-colored aux LEDs under the optic, 16 of them, which work a bit like tritium vials. It is a “hot rod” in the hottest sense of the term, and can start fires. It has earned its reputation as a “nut roaster”, so caution is advised. 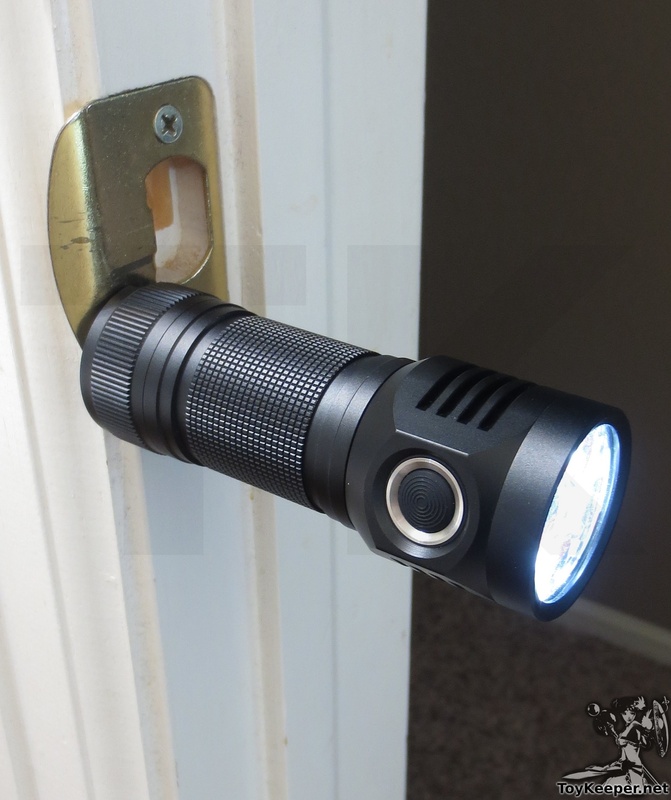 Lock the light while not using it, by clicking 6 times or loosening the tailcap. The D4S is a more appropriate size for its power level, has some extra protections built in, and should be less prone to starting fires. However, it is still designed for maximum output and caution is still advised. Disclaimer: I am not an impartial reviewer. I was hired to write the firmware for the D4S, I received a prototype unit for development, and I received a near-production unit for review. Disclaimer 2: Since the light isn’t actually out yet (as of 2018-07-14), I don’t know a lot of details about official specs or models or anything. 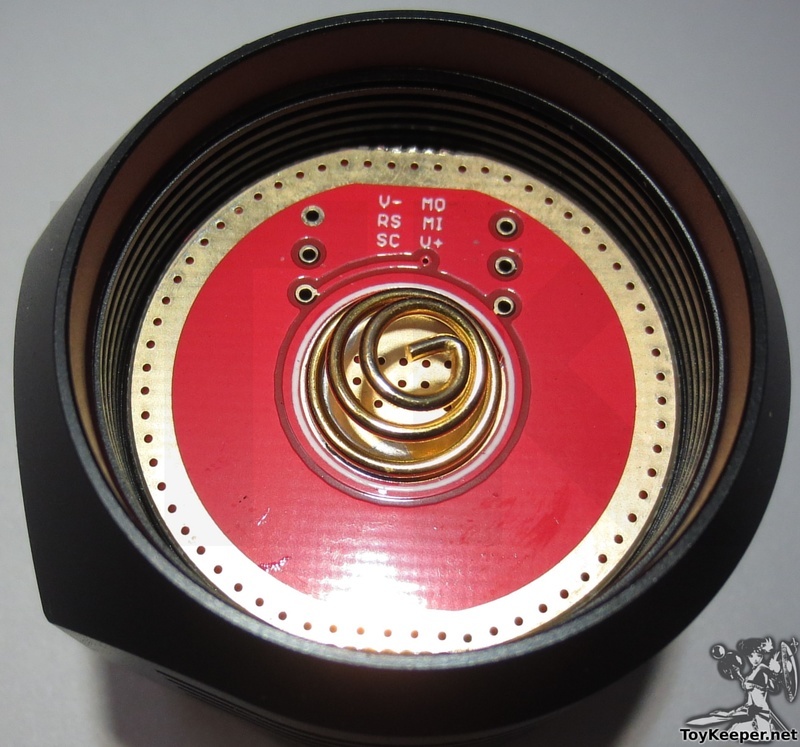 I’m reviewing an almost-production unit which shipped without branding or O-rings, but should otherwise be pretty much the same as the final product. Disclaimer 3: This is a quick and incomplete review since the light showed up only a day before I leave for a trip, but I’ll try to fill in more details over time. What’s the difference between D4 and D4S? More throw — about 2X-3X as many candelas. Longer runtimes due to 26650 cell. Higher regulated output: ~400 lm instead of ~150 lm (3×7135 instead of 1×7135). 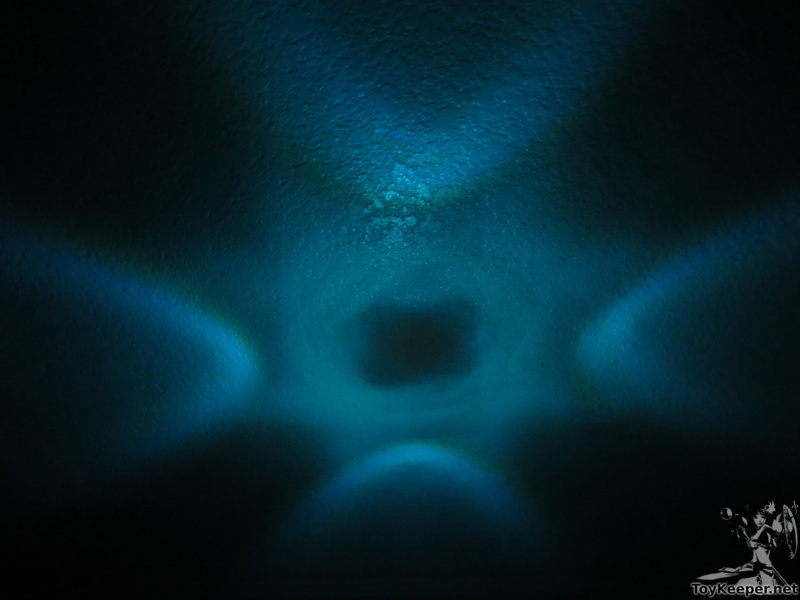 Cyan-colored aux LEDs under the optic. 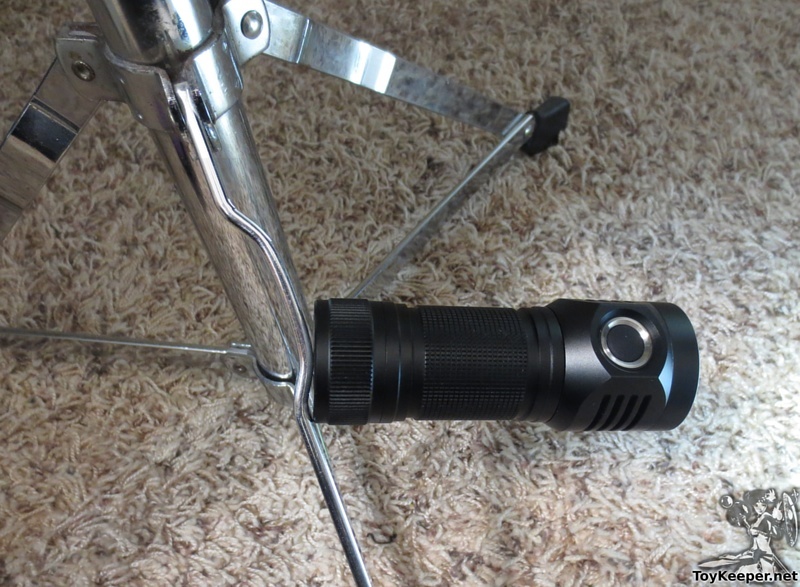 Olight-style square knurling for grip. Firmware-update vias added on battery side of the driver, so it can be reflashed without soldering anything. A bunch of firmware improvements, detailed below. 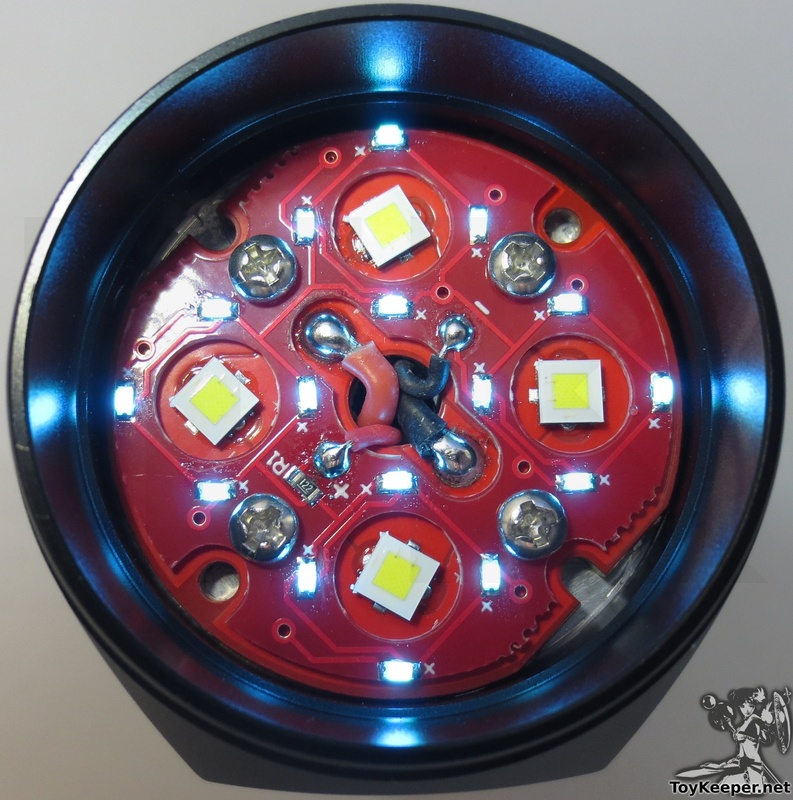 The aux LEDs activate when the main emitters are turned off. On high, they seem about as bright as moon mode but they use less power. Note: The optic is not cracked. The weird-looking bit at the upper right is where the plastic was injected into the mold, and does not touch any of the optic cups. A lot of things changed in the firmware. I tossed out the old code entirely, and made the new version by adapting Anduril to match Hank’s specifications. So even though it should act mostly the same from a user’s point of view, the new code is totally different under the hood. Completely new code base, using FSM instead of Narsil. Significantly simpler and easier to modify. Uses dynamic underclocking to extend runtime on the lowest modes. Moon should run about 3X longer per mAh. Can be reflashed with other FSM-based UIs, including Anduril. Supports the use of aux LEDs. To change the aux LED mode for “off”, click 7 times from off. To change the aux LED mode for lockout mode, click 3 times while in lockout. The battery-connection blink is much faster. Lock and unlock blinks are much faster. In addition to the smooth ramp, it also has a stepped ramp for those who prefer discrete output levels. Smooth and stepped ramps both have configurable floor and ceiling, and the stepped ramp has a configurable number of steps. This is identical to Anduril, and is configured in the same way. 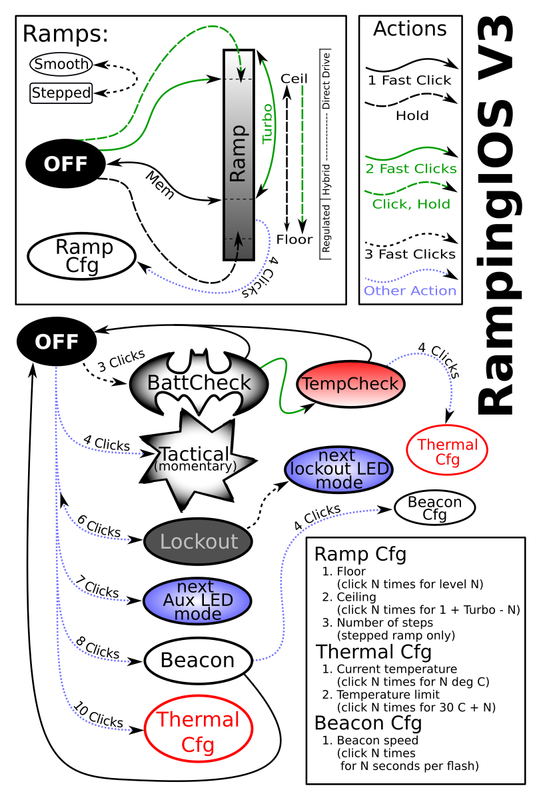 Smooth and stepped ramps can have different settings, which behaves sort of like having two different mode groups. Double-click from off goes to the user-configured ceiling instead of turbo. But turbo is still accessible with a double-click when the light is already on. Holding the button to ramp always goes up unless the button was released less than a second ago. No need to remember ramp direction any more. The user can now “click, release, hold” to ramp down. Thermal regulation is much smoother now, too smooth to see by eye, and should be less prone to oscillating. Thermal config is now accessible by 4 clicks from tempcheck mode, in addition to the usual 10 clicks from off. Sensor calibration. Click N times to tell it the current temperature is N degrees C.
Set maximum temperature precisely. Click N times to set thermal limit to 30 C plus N. Default is 45 C.
Momentary/tactical mode uses last-ramped brightness instead of turbo. 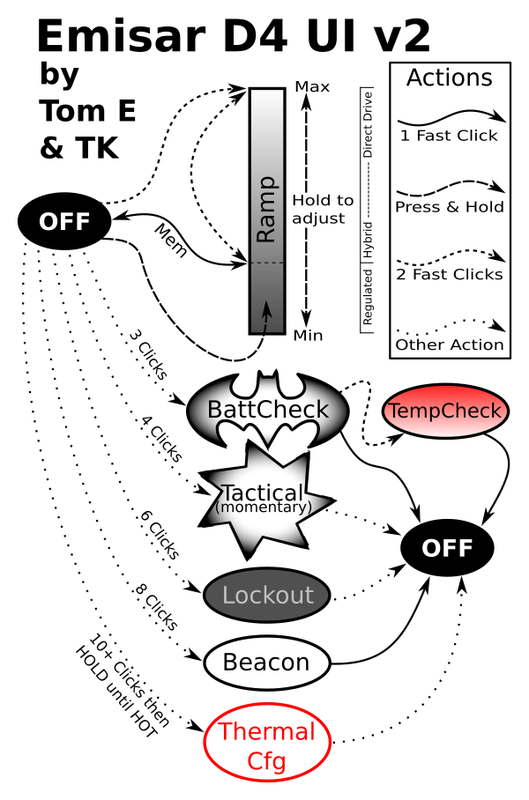 Momentary/tactical mode stays active until battery is disconnected, so it can be used for signalling. No pattern of clicks will exit the mode. Beacon timing is now configurable. Lockout mode doubles as a momentary moon/low mode, so it doesn’t need to be unlocked for quick tasks. Update 2018-08-06: Source code is in my flashlight firmware repository, merged into the trunk (main) branch. 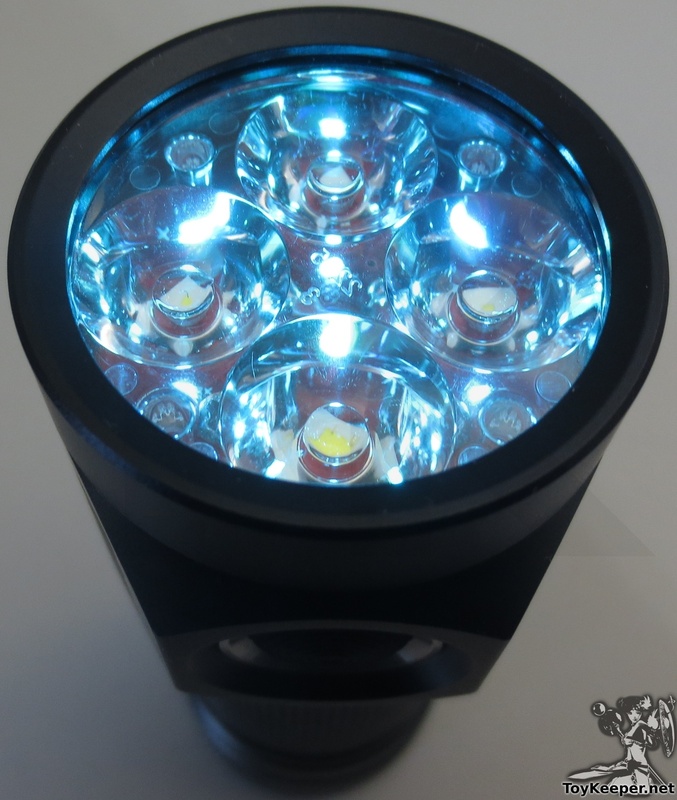 This light is also fully supported by Anduril, for those who want more modes and features. Reflashing is done acupuncture-style with a set of six pins instead of a SOIC8 clip. 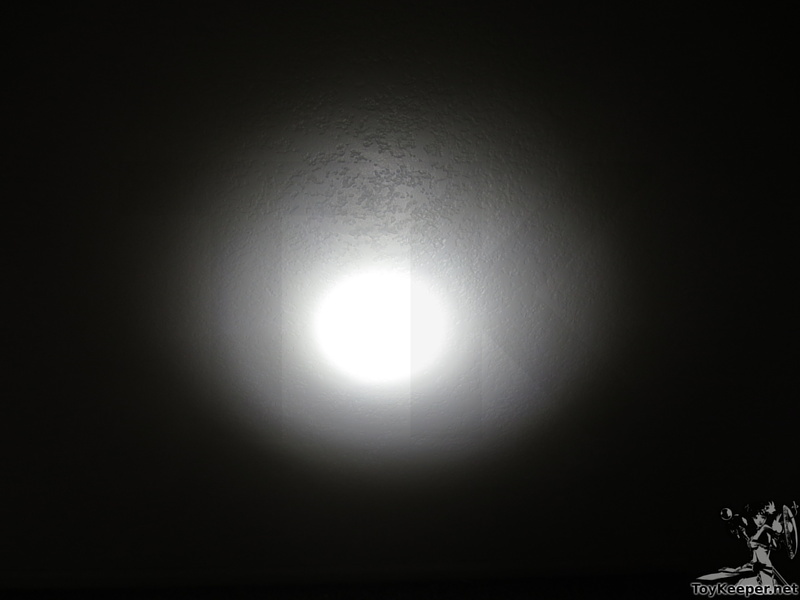 The D4S is throwier than the D4, and it has a nice beam with only minimal artifacts. It has a round hotspot, a reflector-like spill area, and then some mild extra junk outside the edge of the spill. 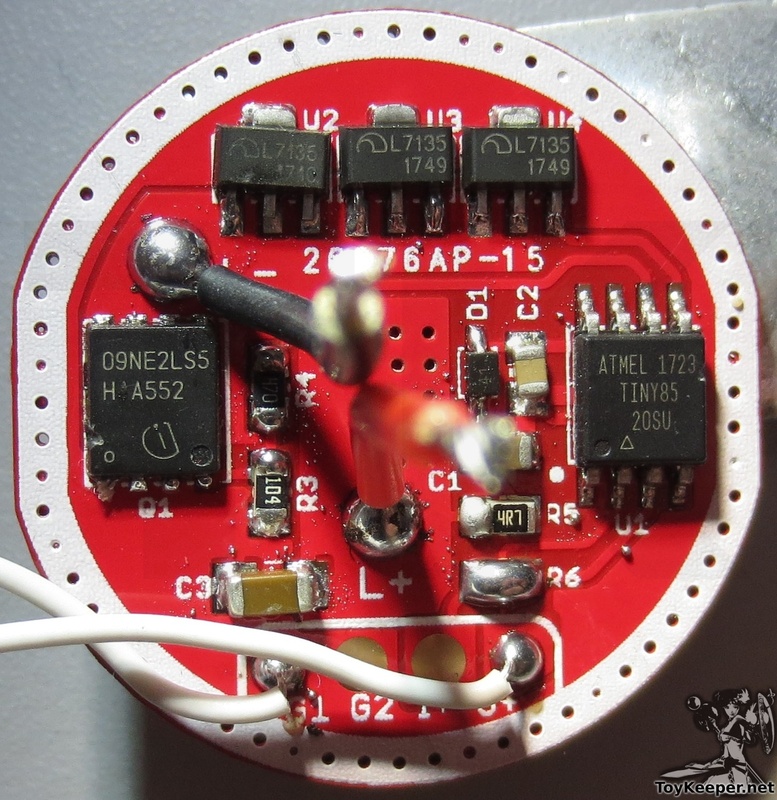 I can’t get great measurements right now, as I don’ have a proper high-amp 26650 cell to use. I’ll have to measure that after I return from my trip. For now, these values are approximate based on some mediocre measurements and sometimes a little math. Full turbo, with water cooling: ~13 minutes? 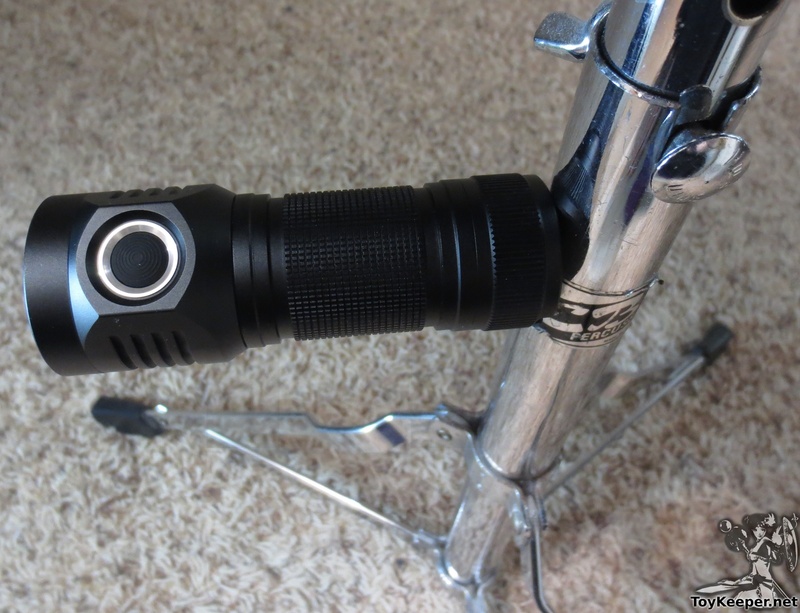 The ramp is shaped to provide a similar amount of brightness resolution at the low end, compared to the D4… but the boundary between regulated and direct drive is higher. So the boundary blink happens later and higher, and it’s closer to the ceiling blink. Above the boundary threshold point, it ramps up pretty quickly. 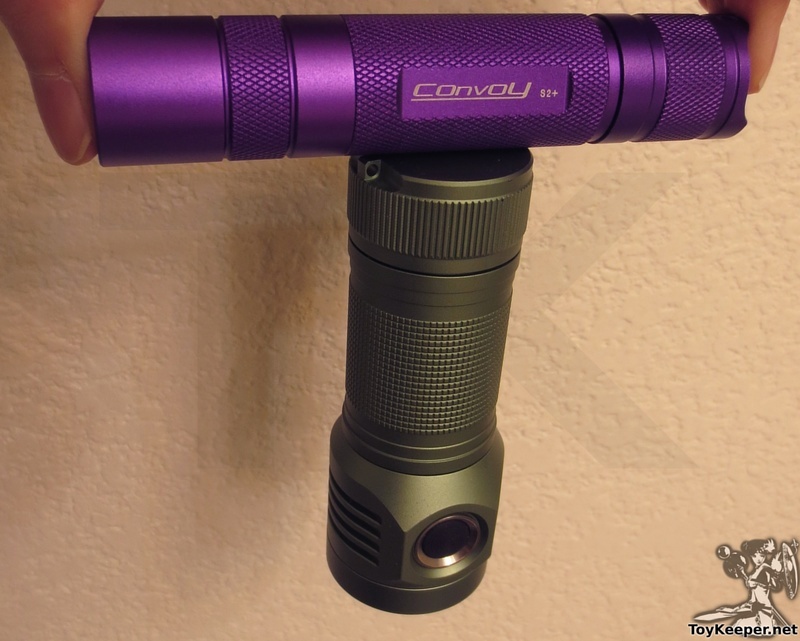 The D4S body is just what one would expect from Emisar, but with some improvements. Even my early prototype, assembled out of rejected parts, was pretty good. 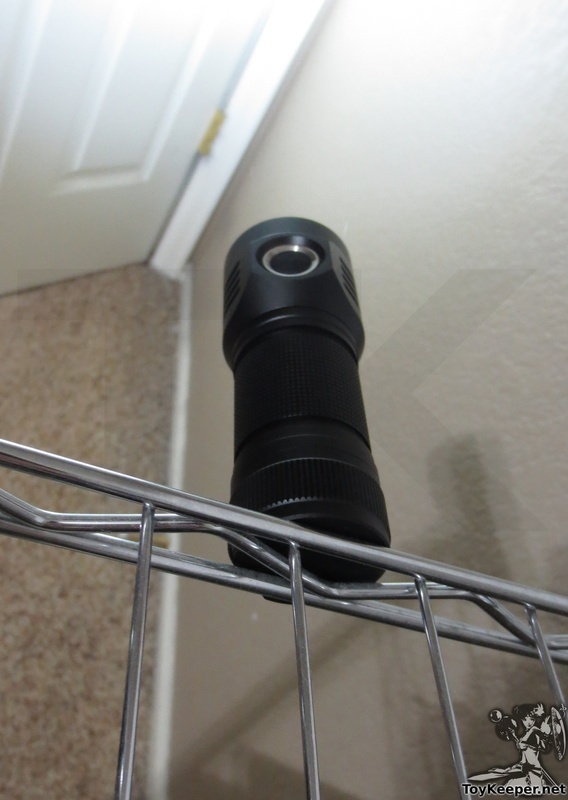 The new knurling is nice, the lanyard hole should satisfy a lot of people who wanted one, the magnet is awesome for people who want one, and the quality is overally very high. The recessed button is also a very nice touch, and should reduce accidental activations, though it’ll be harder to remove the button retaining ring if anyone wants to do that. The lanyard hole on mine has some sharp edges, but Hank tells me this is fixed in production. Also, my early model doesn’t yet have O-rings or an AR-coated lens, but those are supposed to be fixed too. Emisar’s prior AR coating is a type which doesn’t significantly flavor the beam, so I don’t really mind it. I still prefer plain glass when I can get it though. The D4S is initially available in green and black. Maybe other colors too (TBD). The springs are Hank’s signature springs — extra-low resistance for maximum current, designed to lay flat with a battery inserted. Threads on the battery tube appear to be trapezoidal, with deep but narrow grooves. 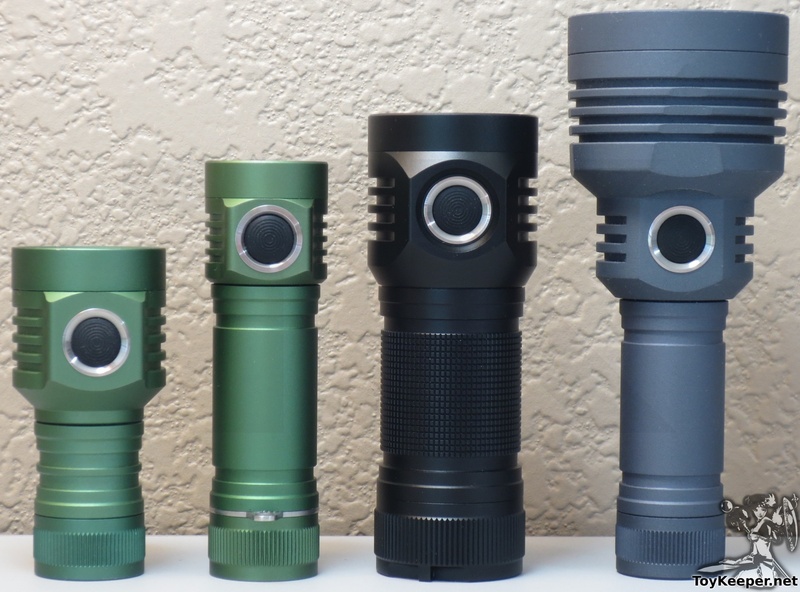 Here’s a size comparison of Emisar’s D1 (in 18350 mode), D4, D4S, and D1S. Smaller part of a drum throne? Check. 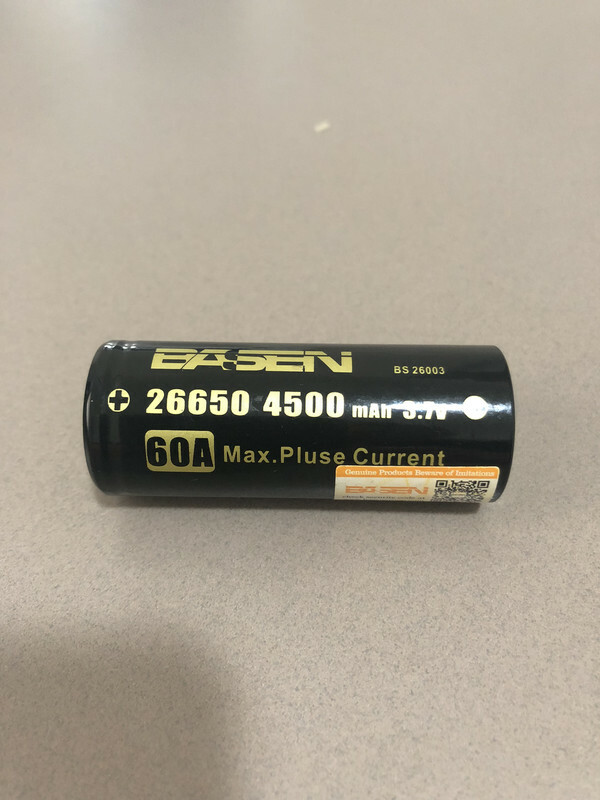 18650 cell stored inside an aluminum flashlight? Check. The edge of a single screw attached to a moving fan? Check. Honestly, I think Hank may have overdone it a bit with the magnet strength. But all you people out there who complained about weaksauce magnets? YOU HAVE BEEN HEARD. There is a copper MCPCB for the main emitters and a secondary PCB for the aux LEDs, stacked directly on top. The MCPCB is available from Intl-Outdoor.com with various emitters on it. Instead of a FET+1, this driver is a FET+3. 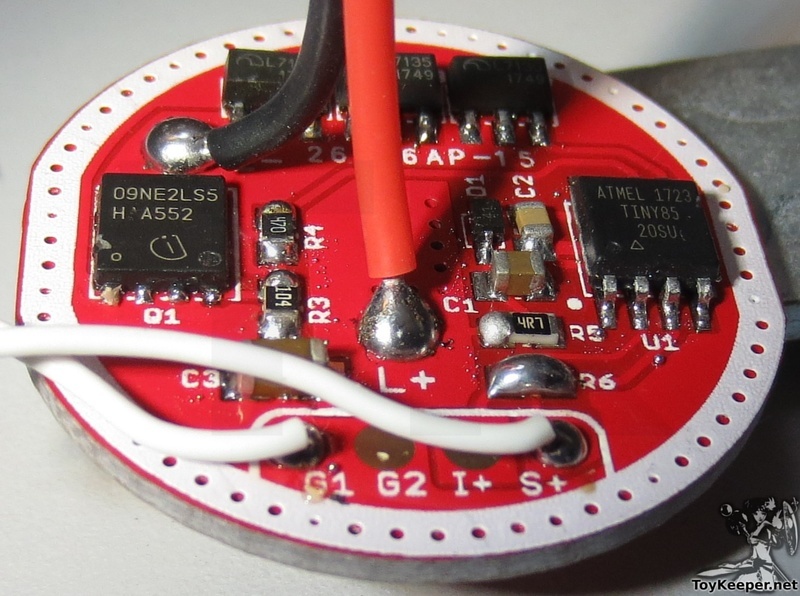 And it has spring-side vias for easier reflashing, because I bugged Hank about it and he liked the idea. I’m hoping he’ll carry a flashing kit too, but I haven’t heard back about that. Regulated output goes up to about 400 lumens, and full turbo is in the range of 3000 to 5000 lumens depending on emitter type, battery type, and how the measuring equipment is calibrated. 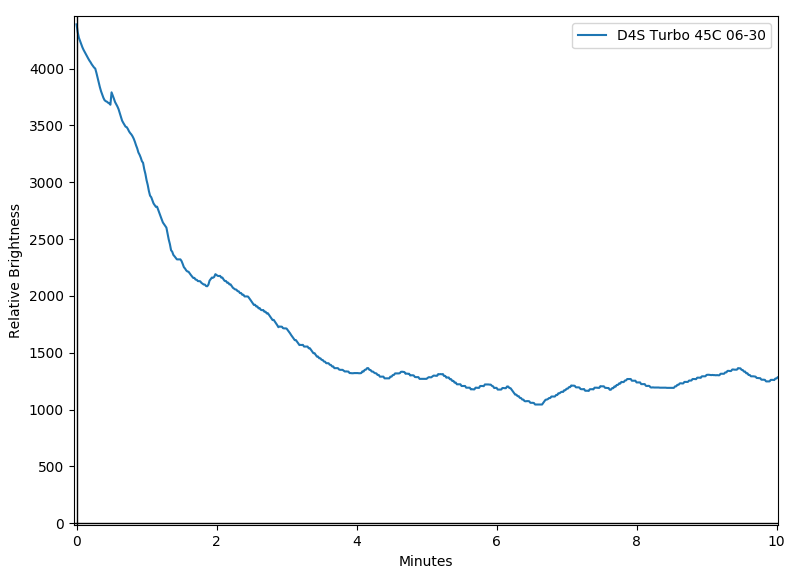 Here is the regulation pattern I measured on my D4S prototype with XP-L HI emitters. It shows brightness over time, not temperature. 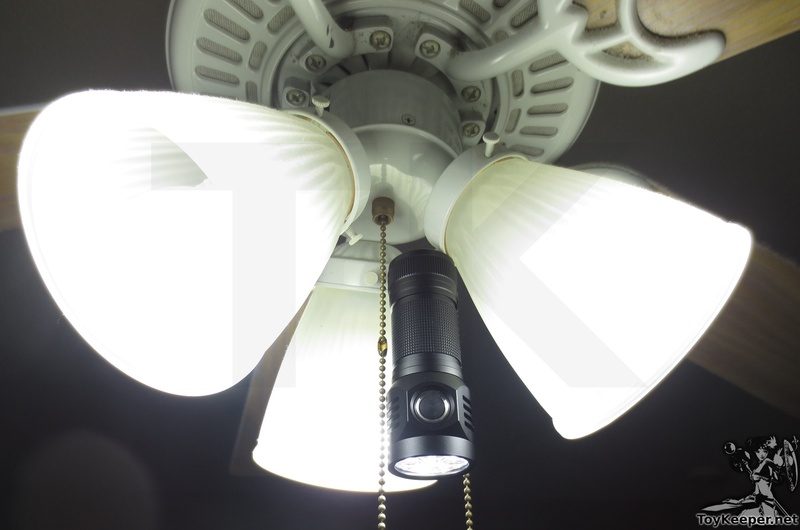 This was at full power with the light laying sideways on a table with a fan blowing at it. 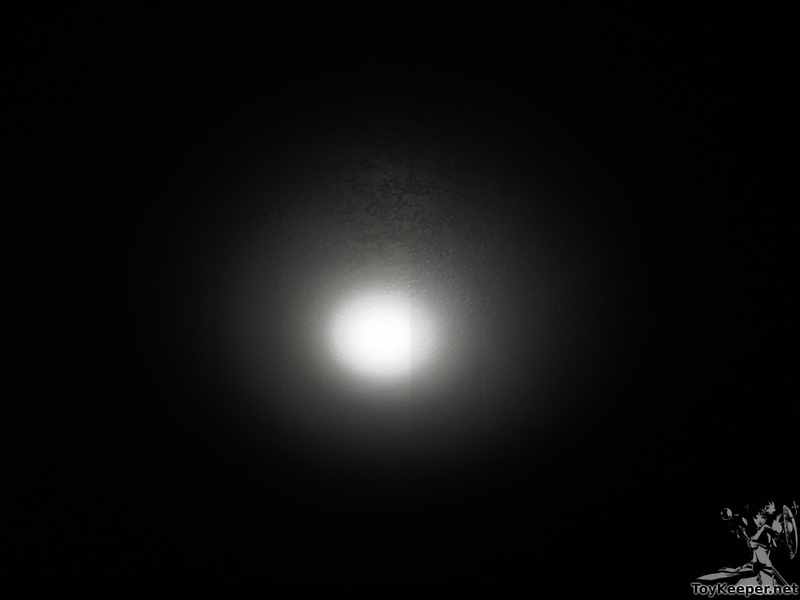 The little bump at the beginning was caused by touching the light to check its temperature. Actual lumen levels are approximate, since this test was done with a cellphone’s light sensor instead of a proper integrating sphere. In case anyone is confused about what’s what. And of course size and shape. No idea. Probably very soon? 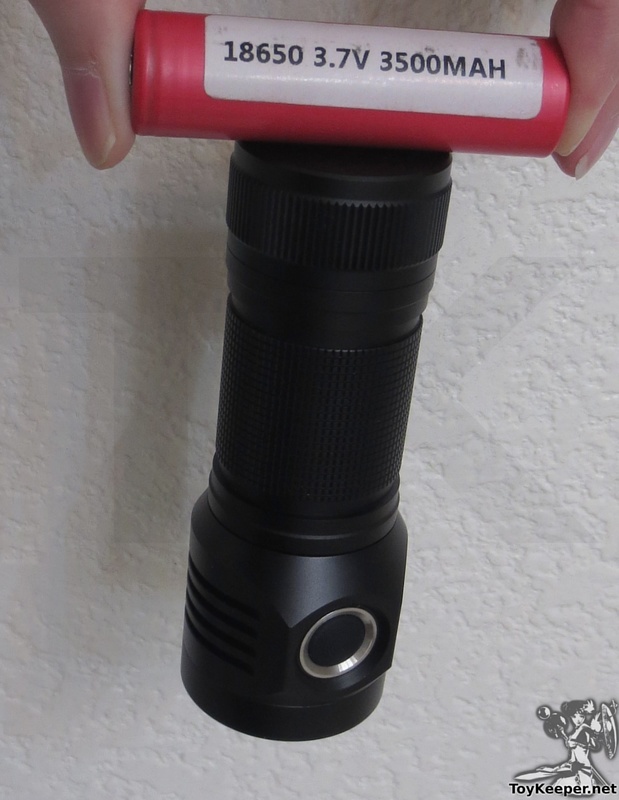 I don’t know, but Emisar’s prices are usually very reasonable. (TBD) The best one I’ve found is the Shockli 5500 mAh cell. Why aren’t there more FAQs? um… *eyes dart around nervously* … mistakes were made? … *ahem* … Okay, move along, nothing to see here. Show’s over, folks. Sorry, I don’t have any branded D4S tailcaps, and showing their bare bottoms might violate the rule against indecent pictures. So I’ll just end things here and wait for production models to cover themselves up. I just bought this quad board and optics a few day’s ago, wonder when Hank is going to be selling the secondary/aux LED top board, and in what colors? Well dang. That’s awesome. Gotta have one. I been waiting for this one..
You all know I just HAVE to have one of these, right? TK, excellent work on the cram review, thank you for making it happen. Be careful out there, the best to Queen Goddess. Be nice if magnet was removable or had optional non magnet tail cap. 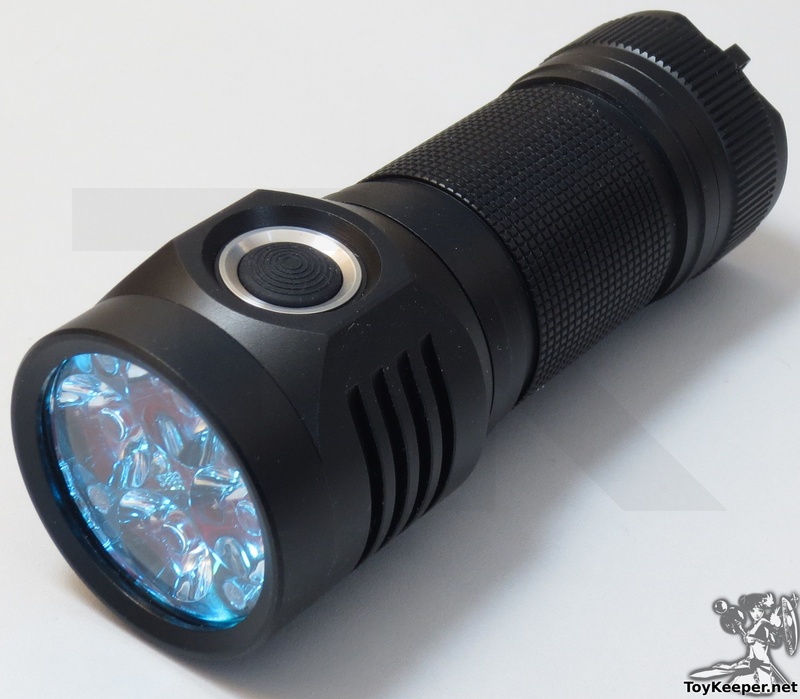 Every time I decide to slow down on purchasing lights along comes this D4S a must have for sure. I know, I’ll slow down on my impulse buying of lights, hum does that make any sense..? No..
Have a safe trip TK, thanks again. I guess by optional I meant be nice to be able to have a removable magnet or a both tail caps available in case it is a permanent fixture of the tail cap. Any buzz about tube colors? I don’t know how the retail package will work, but I got two tailcaps with mine. Nice. Id buy 2. Also noticed that the d4 price dropped 5 bucks and the xpl option also came down in price. 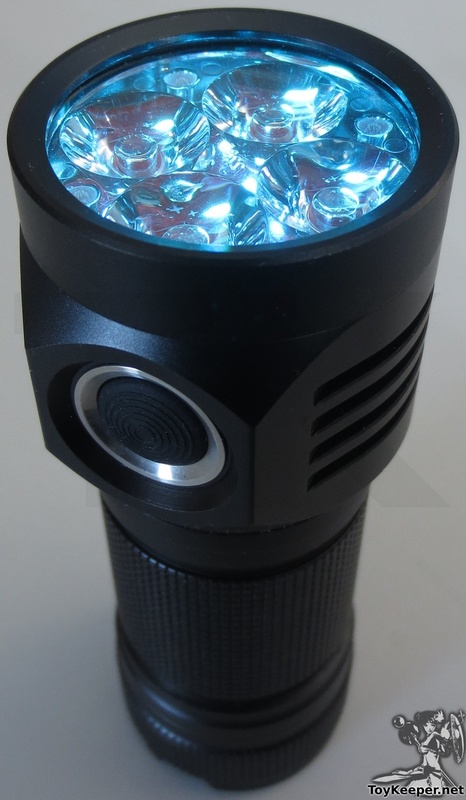 I’m a big fan of flood beam and in my D4 I use the Carclo 10623 instead of 10622 for better flood. The D4S it seems that uses the Ledil Angie-S and for people like me Ledil have Angie-M and Angie-W with more angle of light/flood (and less throw). I don’t know if they are going to be compatible but I think if. Thanks for the heads up on this new D4S. Great improvements, especially the UI w floor/ceiling, 26650 format, knurling and aux blue leds. Love it. Want one. NOW!!! Thanks for the review! I really like the aux LEDs, what is their default setting? Low/high/off? Why don’t you prefer the magnetic tail cap? secondary mcpcb looks amazing, as does the entire light! 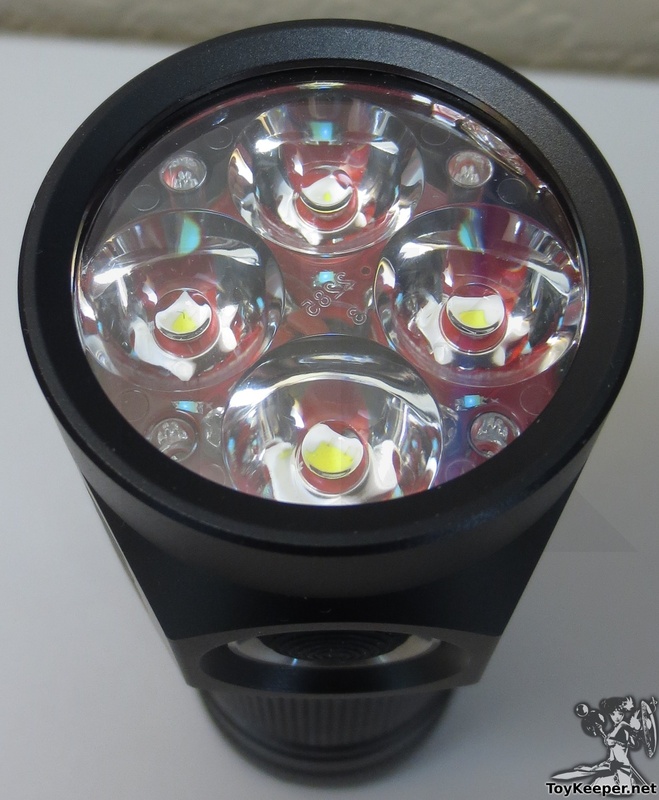 I don’t have any Emisar lights because I avoid paying more than $25 or so for a finished flashlight (other than the Q8), but I have a fondness for 26650 lights, and I think I NEED a D4S! Is it just the optic that make it more throwy than the D4? If so where can I get different optics for my D4? 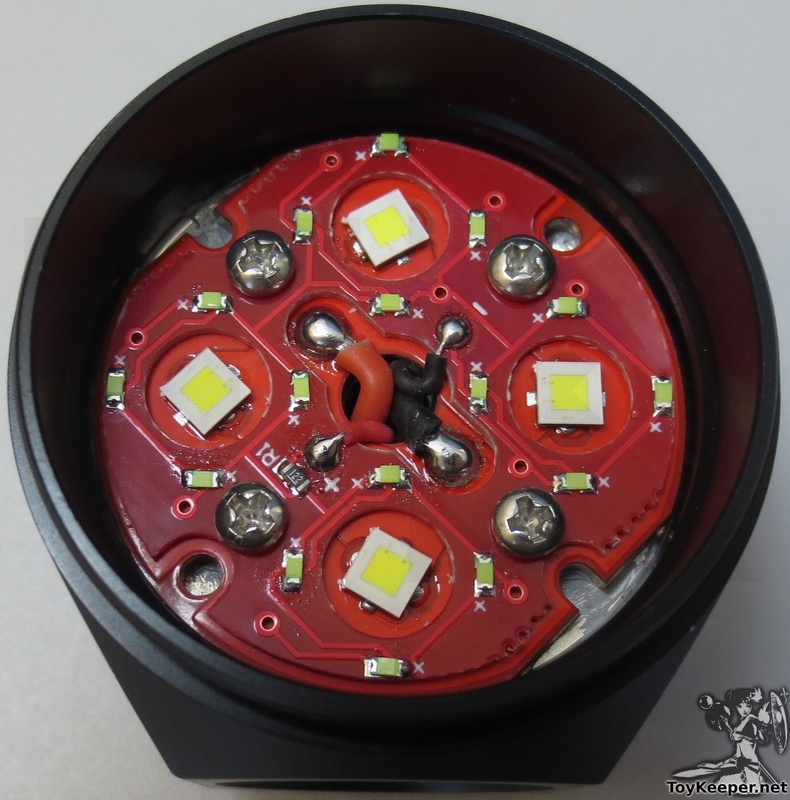 How do you reflow the aux leds? They’re so tiny it must be hard so know the orientation or not? Also quite interesting it will be available in green (again), very much to my liking. Thanks for the review TK. I only just got the D4 and now this, I must own it!!!! I really wish there will be something like the D4/D4s with forward tail clicky and USB-charging. Swapping batteries every day in an EDC light instead of simply plugging it to a USB charger anywhere is just too tedious for me. The D4s can sustain ~1100-1300 Lumen for an extended period of time? Looks promising!